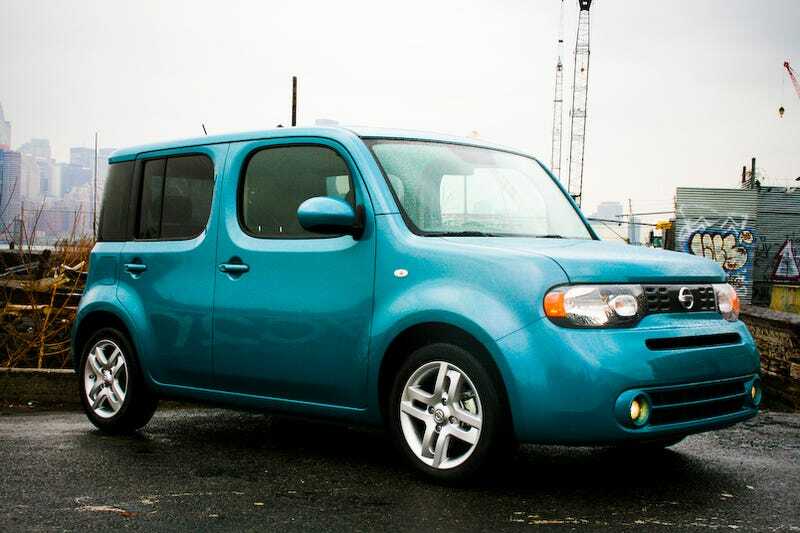 The 2009 Nissan Cube was designed for me: a young, design-conscious urban dweller. It's not a car; it's a mobile lifestyle enabler. Why, then, don't I like it? Based on the Nissan Versa and sharing its 1.8-liter, 122 HP engine, it's here equipped with a continuously variable transmission. But really, the Cube's raison d'etre isn't its mechanical ability, but its body style. An upright two box like the Scion xB or Honda Element, the second generation Cube actually predated both those cars. This third generation vehicle, the first to be offered in the United States, attempts to soften the square edges, boosting both the design appeal and interior space. The exterior is the kind of thing vacuous aesthetes go gaga for. The asymmetry and rounded boxes subvert traditional car archetypes into something that's more akin to a slightly outdated piece of architecture or furniture. While its profile is strikingly similar to that xB, it's radically different in detail, immediately looking like no other car on the road. Especially in a vibrant color like this teal, you'll stand out on the road in a way that might trouble men not confident in their sexuality. But according to Nissan it's the interior that makes the car special. And that's where the Cube's argument starts to fall apart. Those heavily curved window apertures aren't repeated on the insides, creating square windowsills that are blocked off externally by the curves. The large, blacked off, asymmetrical rear 3/4 panel that so defines the exterior is also not repeated on the inside, it just masks traditional pillars and window placement. The narrow, vertical glass house and large, flat roof creates a dark, depressing interior environment that's not helped by the cheap plastics, outdated instruments and distinct lack of toys. Cubby holes, shelves and places to hang your man bag abound, but sitting in the Cube, you feel like an item being stored in a plastic cabinet, not a human driving a car. And while the upright design leads to spacious accommodation for five with a surprising amount of legroom given the exterior dimensions, actual utility is somewhat lacking. The trunk is ridiculously small and folding down the rear seats only results in a very square, but awkwardly shaped and surprisingly small area for cargo. A traditional five-door hatch is equivalent or better at hauling stuff in every way but height. Nissan would like US customers to think of the Cube as a mobile living room, a concept created for space poor dwellers of Tokyo who need a car to double as mobile space for entertaining, relaxing, changing clothes and getting busy. That concept could be perfect for American teenagers, who are forced out of the house by creepily conservative parents yet are denied entry into venues for socializing. The only problem is that Americans like to do one thing that residents of Tokyo don't get the opportunity to: drive. The Cube isn't good at that. Refinement is spoiled by the bouncy ride and the huge amount of noise coming from both the raucously unrefined engine as it annoyingly buzzes at constant, CVT-dictated revs, and also the wind noise created by the body and windshield's 90-degree opposition to the air. The Cube never feels dangerously slow (0-to-60 takes 9.3 seconds) nor dangerously ill handling, but its ability is, at best, basic. Compare to class-transcending rivals like the 2009 Honda Fit Sport, the Cube just isn't at all enjoyable to drive. The Cube also doesn't make up for this by being extremely efficient; we'd expect economy to be in line with the Versa's 27 MPG City, 33 Highway figures. It's the Honda Fit that I constantly compared the Cube while I was driving it. While the Fit doesn't attempt to accomplish anything spectacular design wise, it ends up being a far more appealing vehicle thanks to an interior and driving experience that are far more capable than its size or spec sheet would suggest. The Cube is the opposite; its whacky looks aren't backed up by substance. The Cube does have one thing going for it: price. Starting at just $13,990 with a six-speed manual, the CVT-equipped version you see here runs $15,690, while you can spend all the way up to $19,370 for the bells and whistles Krom version. The smaller, but more capable Honda Fit starts at $14,750, while the xB is $16,420. So while young, design-conscious urban dwellers will be drawn to the Cube for its unconventional styling, they'll be disappointed by the distinctly conventional interior, utility and driving experience. It'll end up serving them just like a normal car, which is exactly what they'd be trying to avoid by purchasing one.